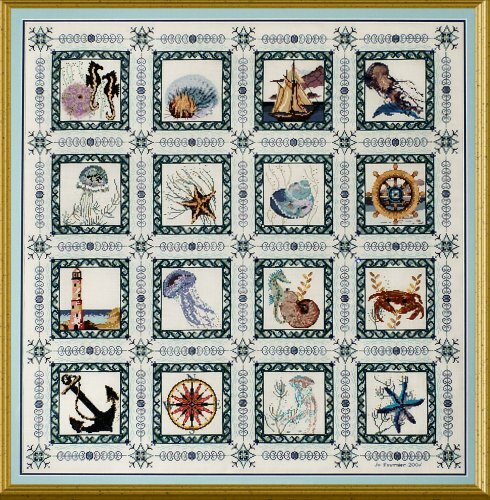 16 small natutical and sea designs that can be stitched alone or as one large design. Beautiful threads and beads are used along with a variety of specialty stitches. Choose 4 designs and creat a bellpull. Q: Is it just the pattern or a kit. Seems high for just a pattern? A: The price listed is for the pattern only. Chatelaine patterns are extremely detailed and complex. The chart packs contain dozens of pages. With materials these charts are quite an investment but you will have a finished design that is truly museum quality. They are absolutely stunning. If you are an advanced stitcher and can work with a wide variety of threads, beads, and specialty stitches then these charts may be the challenge you need to take your work to the next level. 44 points will be rewarded to you when you buy this item. You must be a registered customer to receive points.